I've great respect for Korea. South Korea is in turmoil due to corruption within the offices of President Geun-hye Park. Visitors and non-Koreans are troubled by ongoing public demonstrations throughout central Seoul (and in other cities). The energies of the crowds and police are unsettling, with major potential for escalating violence. "Huge rallies have been held across South Korea for what are thought to be the largest protests so far demanding President Park Geun-hye steps down. ... Organisers said 1.5 million were in Seoul ... Police put the turnout in the capital at 270,000." 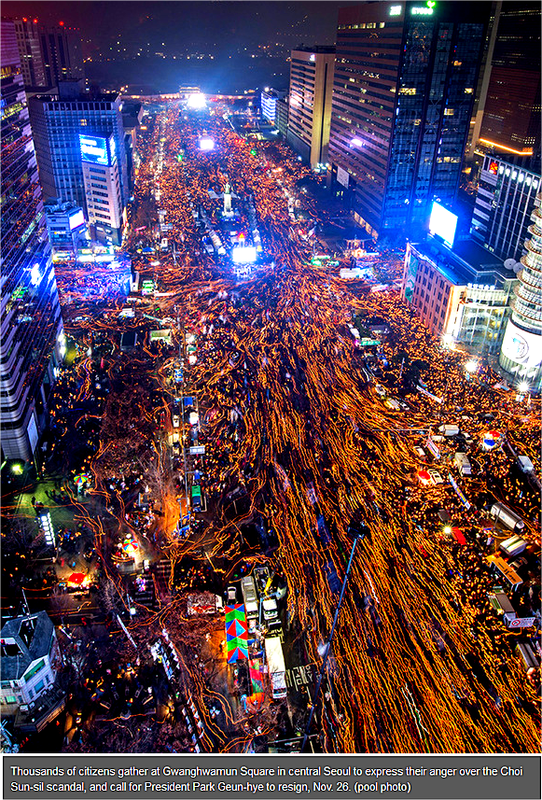 Hankyoreh reports: "For Nov. 26, the organizers estimated 1.5 million people had gone to Gwanghwmun Square in central Seoul by 9:40 pm, with another 100,000 taking to streets in Busan, 70,000 in Gwangju, and 40,000 in Daegu, for a total of 400,000 more. (Police estimated 270,000 for Seoul and 50,000 for the rest of the country.) It was the biggest demonstration in history." Can we trust official figures? Or is this deliberate misstatement? Support for President Park is reported elsewhere to be in single digits (recent reports say 4%): do numbers have basis in fact? Koreans look stupid & unreliable when continuously tolerating gross misinformation. "Brownie, you're doing a heck of a job"